Europa and Lovecraft: if there is a sea of liquid water under Europa’s crust, is there life as well? An image of Europa released by the Jet Propulsion Laboratory in Pasadena, Calif., in 1996 by the Galileo spacecraft (www.nasa.gov). Currently, Jupiter is known to have at least 63 moons; however, in 1610 Galileo discovered the planet’s four largest moons: Io, Ganymede, Callisto and Europa. Europa is the second closet. In 1979 the Voyager 2 space probe passed by Europa. 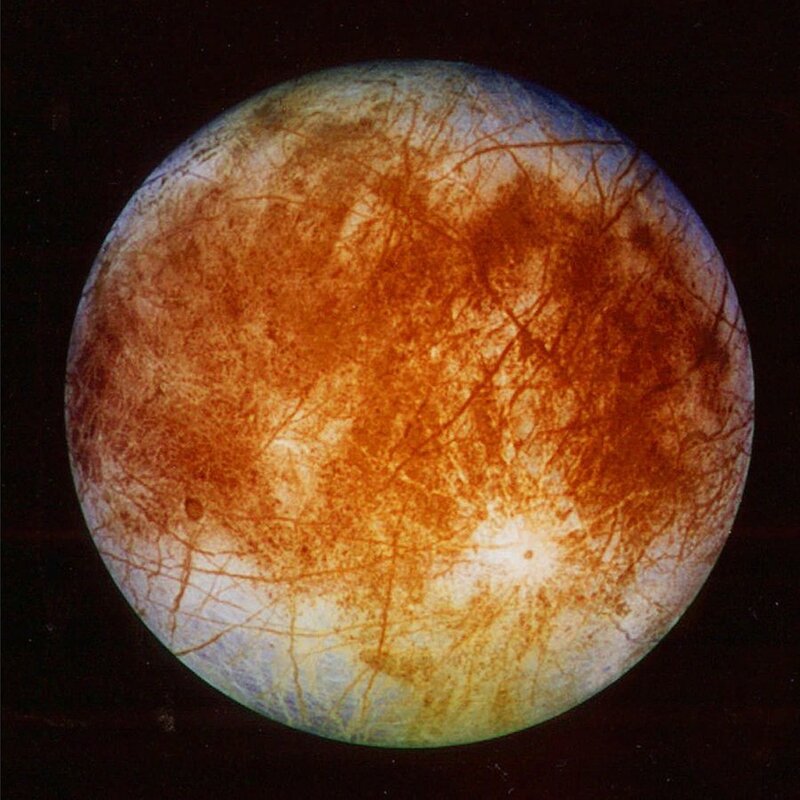 While Europa is about the size of our moon it lacks the craters and topography found on our satellite. This general lack of topography and reflectiveness suggested Europa was covered by a thick ice crust and the complex pattern of dark lines observed on its surface may be ice fractures (Carl Sagan, Cosmos, 1980). In addition to having an icy crust, Europa is known to experience severe moon-wide tides due to the strong gravitational influence of Jupiter. This tidal influence is substantially larger than the influence our moon has on ocean tides on the Earth. Remember Jupiter is incredibly large; it would take more than 1,300 Earths to fill the volume of Jupiter! The gravitational interactions between Europa and Jupiter, as well as the additional influence of Io and Ganymede, causes an incredible amount of friction through tidal stress, which could produce internal heating, resulting in liquid water underneath Europa’s icy crust (Daval Sobel, The Planets, 2005). Data to support this hypothesis of a potentially 160 km (100 miles) deep ocean under Europa’s icy surface came from the Galileo space probe in 1996. Anywhere on Earth where there is water there is life. Thus, this begs the question, if there is a sea of liquid water under Europa’s crust, is there life as well? In the serious consideration of alien life it is now thought that small worlds composed of rock and iron may not necessarily be the most common locations where life will develop and thrive. Instead it may be on icy-cold moons like Europa that orbit large gas giants. One reason for this is that gas giants are more common than tiny rock worlds; approximately 50% of all stars in the universe may have at least one gas giant and for every small Earth-like world there are a hundred gas giants (The Future of the Mind, Michio Kaku, 2014). Heated by tidal forces generated by the gravitational fields of Jupiter and the other major Jovian moons, Europa may have its own alien ecosystem in an ocean completely covered by ice. It was thought that the Galileo probe would have detected geysers of some sort, pushing water to the surface under the tidal stress and pressure but none were observed. However, in 2012 the Hubble Telescope identified giant plumes of water erupting from the surface of Europa. With all of the tantalizing information we have on Europa it is not surprising that NASA has been eyeing it since the Galileo flybys. Thus, this week it has been announced that a plan is underway to launch a space probe sometime in the 2020’s to orbit Jupiter and collect a variety of data on Europa through a series of flybys. Specifically, the probe will have cameras, spectrometers and ice penetrating radar. The thickness of the icy crust will be determined and the salinity of the alien ocean will be measured by measuring the strength and direction of the moon’s magnetic field (The Huffington Post article by Ed Mazza, 22 June 2015). H.P. Lovecraft frequently observed Jupiter in the night sky and has sketched our solar system’s largest planet. He referred to the gas giants as the “superior” planets while he called the small, rocky worlds closer to the sun the “inferior” planets (Collected Essays, Volume 3: Science H.P. Lovecraft; edited by S.T. Joshi, 2005). In Lovecraft’s day Jupiter was thought to have 9 moons as oppose to the 63 moons that have been documented to date. Upon noting the 4 major moons, Lovecraft called them “sensible discs” and also stated, “Conclusions respecting the habitability of these orbs would be baseless. If they do possess inhabitants, a thing by no means impossible, their astronomers must be fortunate indeed, for words cannot describe the grandeur with which Jupiter shines in their nocturnal skies” (Joshi, 2005). 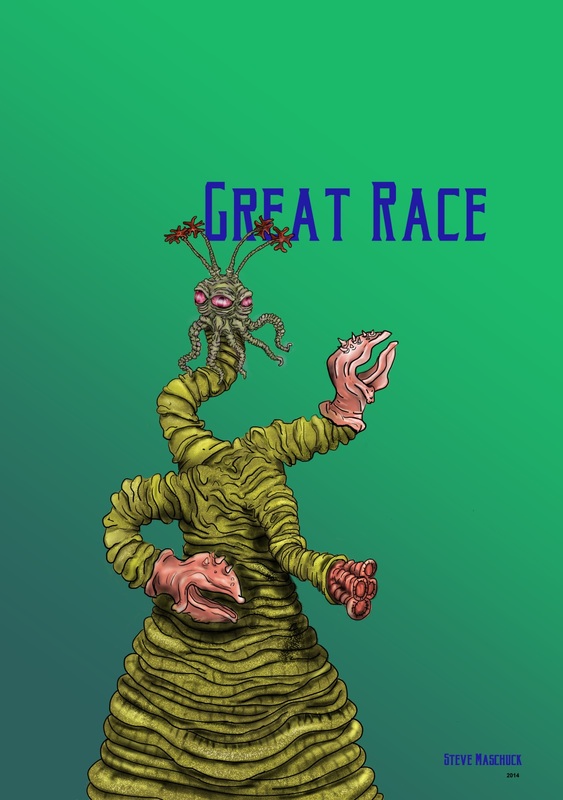 Members of the Great Race would frequently exchange minds with residents of our solar system, including some from the moons of Jupiter (art by Steve Maschuck). In his fiction Lovecraft mentions the Jovian satellites twice. The first time was in “Beyond the Wall of Sleep.” In that tale the entity or mind that possesses Joe Slater talks about his travels through time, space and dimensions, which includes dwelling in “the bodies of the insect –philosophers that crawl proudly over the fourth moon of Jupiter.” The fourth major moon of Jupiter is Callisto. In contrast to Europa, Callisto is thought to be a long dead world with minimal geologic activity on its surface. Evidence of this is due to the moon being heavily cratered, similar to our own inert moon. Maybe the entity that possessed Joe Slater knew of some of the previously unknown moons of Jupiter and Europa is the fourth moon? Of course that means the insect-philosophers would be crawling over an icy moon instead of a dead one. In “The Shadow Out of Time” in the same passage where Peaslee is remembering his acclimation into the body of a Cone-Shaped Being, he recalls meeting other entities from every corner of the solar system. “There was a mind from the planet we know as Venus, which would live incalculable epochs to come, and one from an outer moon of Jupiter six million years in the past.” Thus, while he did not specifically cite Europa, in both his astronomical writings as well as in his fiction Lovecraft thought the moons of Jupiter may be habitable for some form of life. We have learned so much about this strange moon since Lovecraft’s time and hopefully we will soon know more. Detecting even the smallest microbe in the Europan seas would fundamentally change our view of ourselves relative to the rest of the universe. Indeed the presence of alien microbes would make our solar system a little more “Lovecraftian” even if they aren’t insect –philosophers. Read Fred’s blog, Lovecraftian Science. Having seen the movie, Europa Report when it first appeared at the E Street Cinema in D.C. a few years ago, it immediately captured my attention as Cthulhu-esque film. Very well done from beginning to end! Great article, Fred’ one of those that sends the imagination soaring! And that ending just leaves you gasping! Thank you and yes, I agree with you on the ending of Europa Report! I thought that the fourth moon was Europa. I speculated that the arthropodic beings communicated via radio waves and ate metallic lichen. Using Galileo’s system the moons are, in order from closest to farthest from Jupiter – Io, Europa, Ganymede and Callisto – so Europa is typically considered the second moon. Would love to see the metallic lichens!